When we got our Seattle Mariners season tickets five years ago we didn’t realize that the greatest thing about the games wasn’t going to be watching baseball but was rather developing a great friendship with Herb and Janice Blackinton who sit directly behind us. We’ve come to know their kids, grandkids and great-grandkids and have relished in hearing Herb’s laughter and stories. We’ve talked and shared Seattle baseball wins and losses (mostly losses). Herb is 72-years-old and I’ve often said to Shawntel that someday when I’m his age I hope to enjoy life, family and friends like we’ve seen him do. Recently, he took me aside and confided in me that he has been diagnosed with cancer. He then asked me if I wanted to visit his printing business he had built from the ground up and in which he had found great success. While he sold his business 16 years ago to a large public company which afforded him to live a life that most would dream of, he was still very much a part of his business and its success is a very important piece of who he is. I visited his business last week. 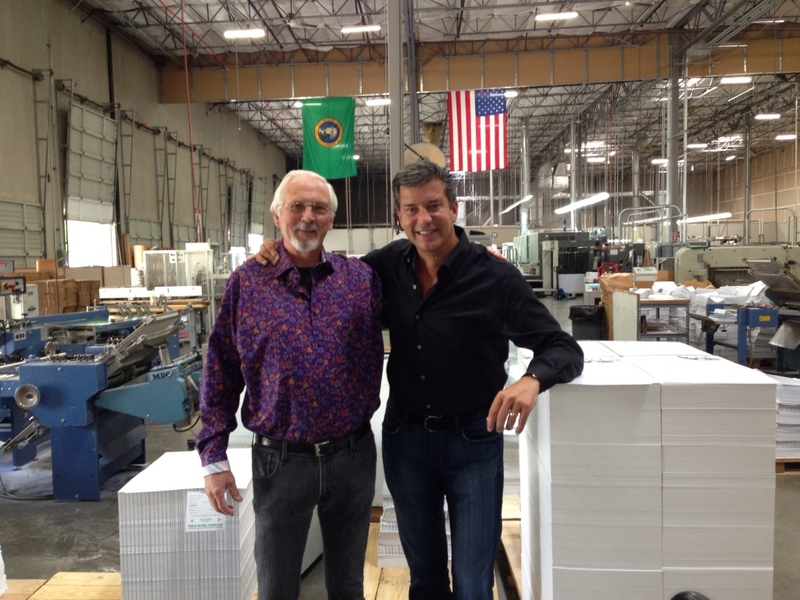 He gave me a tour of the facility and I was able to see his excitement as he talked to me about the large printing presses, their world-class customers, and showed me every aspect of the facility. As we walked throughout the building, he introduced me to employees as if they were family. He knew everyone by name and I marveled at how many employees had worked with him for their entire careers, some for 18, 20, 25 and 30 years or more. Each of their stories was amazing. During our lunch I asked him what three things he felt defined him as a person. He thought for a moment while I waited, knowing this man possessed sage wisdom. He is the type of man I’d be proud to share some of his attributes, a man full of energy and joy, someone who is loved by his family and many friends and is satisfied in his accomplishments, both personal and professional. He smiled then and started with a story. He told me how he wasn’t a heavy practicing Christian, but he saw himself as someone who embraced Christian values, which was his first point of definition. He was never brought up going to church but it was a constant presence in his life. Each week he would attend Cub Scouts, then Boy Scouts, at a local church. The values learned were embedded in his heart. The second defining value was to have a conscience. He told me of how early on in his childhood his father had asked him a simple question, “If you find a wallet on the street with two twenties in it, what do you do with it?” Of course you return it. That is the only answer that will provide a clean conscience. This too was evident in his business. He could not have reached his level of success without truly being honest, open and moral with his work, employees and customers. The final value was family. This was evident even before we went to lunch as his season tickets were always filled with family members who clearly loved and deeply cared for him. He treats his business the same way. Those employees I met while walking through the printing plant, were not just former employees to him, they were family. Important business relationships are not just business, they are valuable and personal relationships that when cultivated will carry you through the toughest of times and make victory so much better when shared with them. I thought back to the visit we had just made to his business and could clearly see how these values had been built into every aspect of the success he had created. He had introduced me to employees like friends, showing his heart of love. Herb again smiled when I told him how I saw these values in his business. I asked him how he thinks of customers. He told me it isn’t all that complicated. It was simple, his customers have a need and it is his job to help them solve it. Focus on treating them like family while solving their need and the money will follow. I’m proud to have been blessed by having Herb in my life. Being diagnosed with cancer is a new challenge in front of him but his smile and optimism once again shows how great a man he is. Even in the face of a great challenge and without having all the answers, he continues to teach me. What a great man! This is awesome! Exactly what I needed to hear today thank you Ryan. Ryan thank you for sharing this great story and life lessons by Herb. I was fortunate to have met a couple that sat in front of me for a few years at Shea Stadium. Art was his name and he use to share life lessons with me and my friends as well. Your story brought me back to those days. Thank you! Ryan this is Herb’s son Steve. It takes an amazing person to say such great things about a person as you said about my dad. Herb is a great person and i respect him more than anything in this world. He (we) will beat this Cancer thing together so we can enjoy many more years of good things and good people. With all the stuff i put my dad and my mom through i don’t know where i would be today with out them. And once again. the stuff you wrote about my dad was incredible. Thanks for being friends with my mom and dad..
Herb left us this week, and it is truly a sad time. I have known Herb since Junior High School. He has been a good friend and client. He was a very humble, generous and caring man. He shared his success with his Native American relations, the Moyer Foundation, the Highline Medical Foundation, and probably others with which I am not familiar. He has had a positive impact on my life and that of many others. I love that man. My name is Anastasia Francis. I have been married to his nephew, Jason, for 10 years this August 7, 2014. Herb and Janice helped Jason helped make the top secret & detailed arrangements for Jaosn’s LIVE marriage proposal to me during a Mariners game in July of 2003– while we were visiting them from the SF BAy Area. The time, the thought, the attention to detail were paramount to Herb and Janice (Jason too) to make this proposal go off without a hitch. Jason was broughtby Aunt Janice to Swissa Jeweler’s (Herb & Janice’s good friends) in downtown Seattle to search for the perfect engagement ring! Herb had ECG print up the largest proposal sign I have ever seen. “Anastasia, will see marry me, Love Jason” which was held by the Mariner Moose (who along with all the fabulous employees in the Diamond Club were in on the surprise. Herb arranged to even have the sports announcers and the TV crew “do a play by LIVE of the proposal seen on TV up and down the West Coast!” as Jason got down on one knee. The ring was presented in a hollowed out baseball that Herb & Janice’s Son, Steve had in his camera case waiting for the “moment” to hand it to Jason! We made the jumbo-tron and all our family & friends back home saw the magical moment on their TV’s. We we did get married in 2004, Herb once again helped create baseball ticket seating tickets for (of course) our baseball themed wedding. I am sad that we all will not have anymore opportunities to listen to his wonderful stories about his amazing journey through this lifetime. He always had a hug to give or a smile that could light up a room. His LOVE for his family & his friends in every action that he took. Herb was a man that talked the talk and walked the walk. A generous and caring man for those who were in his lives and for some who were just passing through. This article above that was so eloquently written was truly a testament to the HERB we all know and love! I am going to print this out and place it in my children’s baby books so that they can keep a piece of Uncle Herbie with them as they grow into wonderful human beings! Thank you sir for such a loving tribute to Herb. Ryan, I was googling Herb tonight and thinking about the few hours I spent with him but the impact he made on me. Growing up I knew Herb through my Uncle who was a good friend but unfortunately I only spent about 50-60 hours with him. We sat around a camp fire, we played cards, we went to a mariner spring training & he hosted a birthday party for my 4 year old son at his house in Arizona. He also would stop in our restaurant in Ellensburg whenever he drove through.He introduced me to his printing business as well and made sure I got the full Herb treatment. I often think what it would have been like to be mentored by Herb and tonight while I googled him I was happy to read your blog and get a little bit of Herbs wisdom shared by you. Thanks for writing about Herb and sharing your thoughts.